The We're All Ears May inspiration are Alexander Calder's mobiles. I went for a somewhat literal interpretation. It took me long to decide on the construction and there were only two dangles!!! 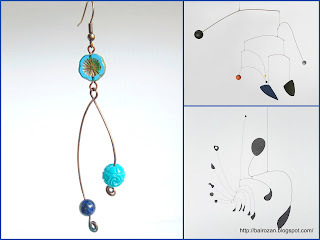 No matter how hard I tried, I couldn't add more, so I suspended the "mobile" from a Czech flower bead. I used cable stripped wire, a turquoise colored resin bead and a lapis bead. Now that I'm writing this post, a lot more ideas are coming to me and I will be exploring them for sure. Вдъхновението на We're All Ears за месец май са кинетичните скулптури на Александър Колдър. Интерпретацията ми е буквална и конструкцията ми отне доста време, а има само две рамена!!! Колкото и да се опитвах, не успях да вкарам трети елемент, затова я окачих на мънисто-цвете от чешко стъкло. Използвах тел от кабел, тюркоазено мънисто от смола и мънисто лазурит. Сега като пиша тази публикация, ми идват доста повече идеи, които със сигурност ще изпробвам по-късно. I'm curious to find out what everybody else made here! Любопитна съм да видя другите участници какво са измислили тук! Публикувано от bairozan в 12:23 ч.
moois van me 19 май 2018 г., 13:26 ч.
bairozan 19 май 2018 г., 15:05 ч.
Kathy Lindemer 19 май 2018 г., 16:08 ч. You did a great job constructing a mini mobile. I love the colors too. bairozan 19 май 2018 г., 19:00 ч.
Divya N 19 май 2018 г., 16:55 ч. Cool! I was planning to do something very similar before I thought of the leather tape idea. Does it spin around? bairozan 19 май 2018 г., 19:01 ч.
TesoriTrovati 21 май 2018 г., 5:20 ч.
I like the way you staggered the dangles. And I am seriously pumped that you are inspired to keep at it! Thanks for playing along with me in the We're All Ears challenge! Enjoy the day! bairozan 21 май 2018 г., 10:07 ч.
CraftyHope 7 юни 2018 г., 4:35 ч.
I really like the simplicity of this. It shows the balance without being too busy! Though, I can't wait to see what some of those other ideas might be too!! bairozan 8 юни 2018 г., 12:12 ч.